The Hubble Space Telescope has continuously unleashed a stream of jaw-dropping intergalactic imagery since it launched on April 24, 1990. Not only do these images, which look more like paintings at first glance, allow researchers to study distant worlds, galaxies and nebulae, they have captured the minds of the general public, getting us genuinely excited about space exploration. 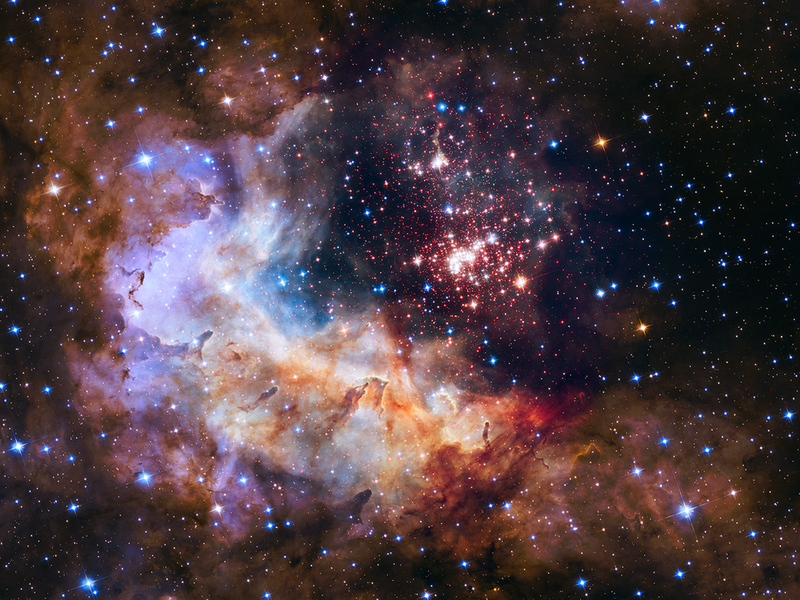 But here's some sad news: despite all of these wonderful things, Hubble is getting older. In a few short years, Hubble's technology will become fully outdated and NASA will let it drift to a fiery death in the atmosphere, like some crazed band of space Vikings. Once gone, at least we know we'll have the gold-encrusted James Webb Space Telescope to keep the images flowing in. With time marching on, let's not worry about what will happen to everyone's favorite space telescope and, instead, take a look at some of the most amazing pictures it's given us over the years. Released on Hubble's 21st anniversary, a pair of galaxies swirl together to form Arp 273. 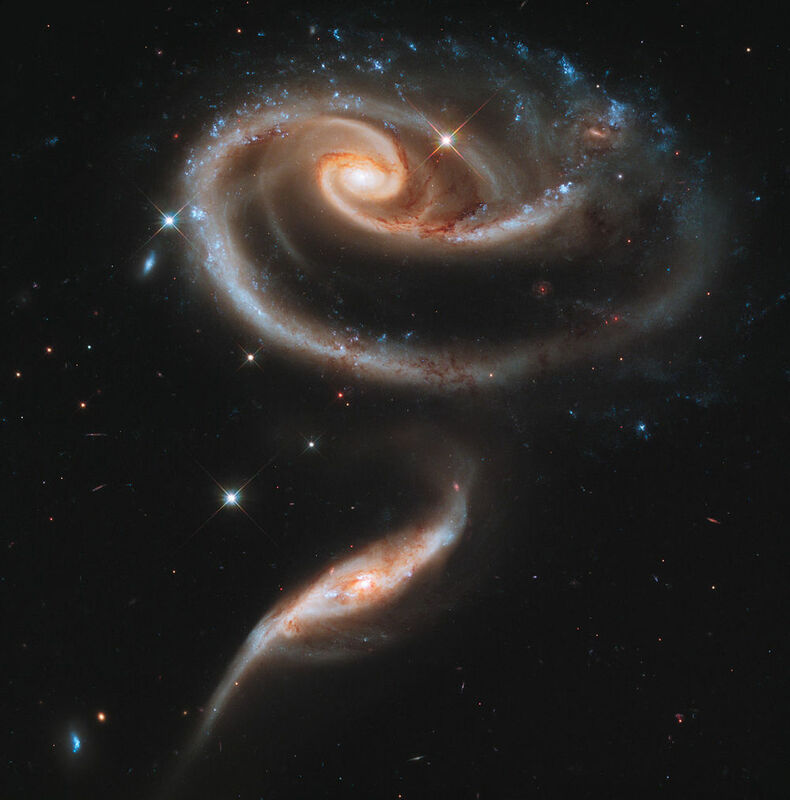 This unique object formed as two galaxies in the Andromeda constellation passed through one another. 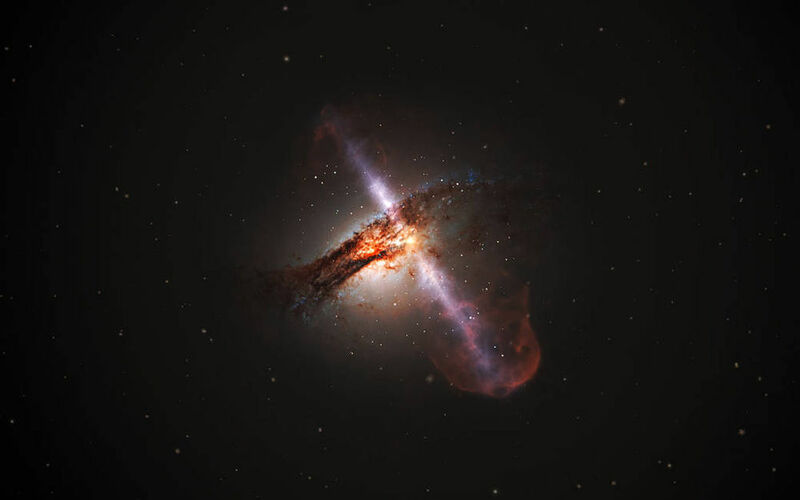 Though there isn't an actual picture of a supermassive black hole (yet), this image possibly captures two of them swirling together and shooting off jets of particles into the universe. Each of these jets, which travel at nearly the speed of light, stretch for thousands of light-years as two galactic nuclei blend together. Taken in 1995, the 'Pillars of Creation' is one of Hubble's most notable images. Inside, you see three cold columns of gas illuminated by stars in the Eagle Nebula. This re-released version of the original adds more detail by including near-infrared light, which helps expose the various stars behind the pillars. 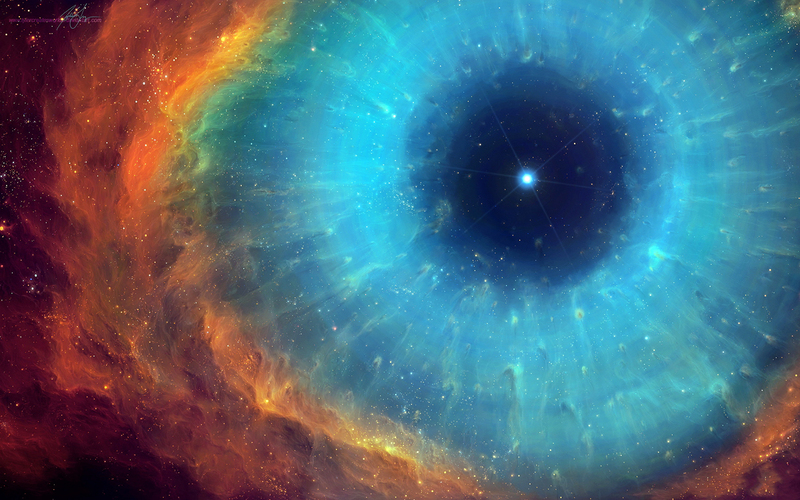 Few other space images have received as much fame and adoration as this one. 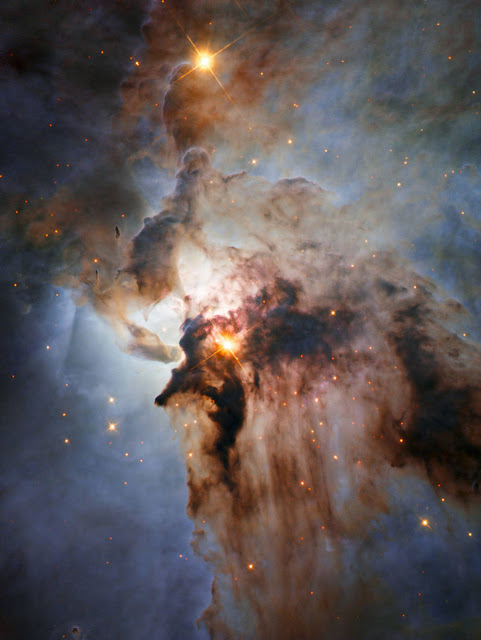 The Lagoon Nebula churns with a series of crazy, huge storms. "The region is filled with intense winds from hot stars, churning funnels of gas, and energetic star formation, all embedded within an intricate haze of gas and pitch-dark dust," NASA notes. This colorful image was released in August 2015. 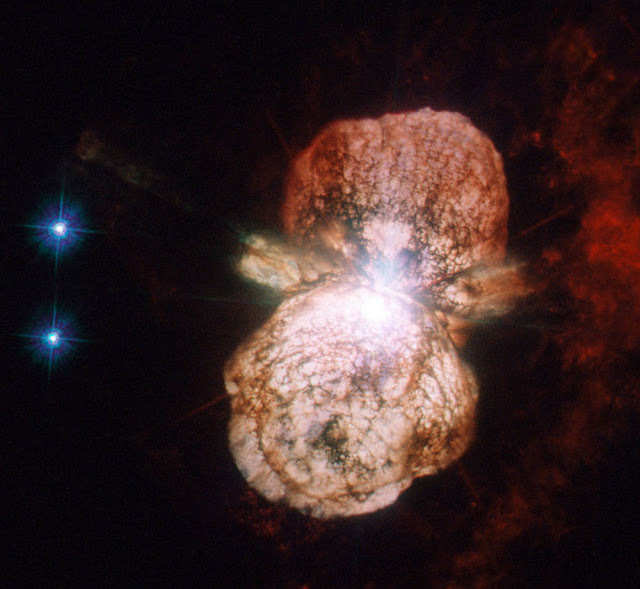 Meet the Eta Carinae system. It has two stars in it and one of them is huge and unstable. Since the 1800s, astronomers with less powerful telescopes have been watching the system's outbursts. However, it wasn't until Hubble came that researchers were able to fully check out the clouds of matter, dubbed the Homunculus Nebula, thrown off by it. This image in particular, which was released in 2012, is one of the most detailed. Researchers refer to these sort of outbursts as 'impostor supernovae' because they appear like normal supernovae but they do not kill off the star. Known scientifically as NGC 3521, this flocculent spiral galaxy appears woolly because of how stars shine through its dusty clouds. Though it seems incredibly close in this image, it actually lies about 40 million light-years away in the constellation of Leo, and it was discovered back in 1784 by William Herschel. Hubble released this incredibly detailed picture back in 2015, though if you were to look at it with an ordinary backyard telescope it would appear like a giant bubble. 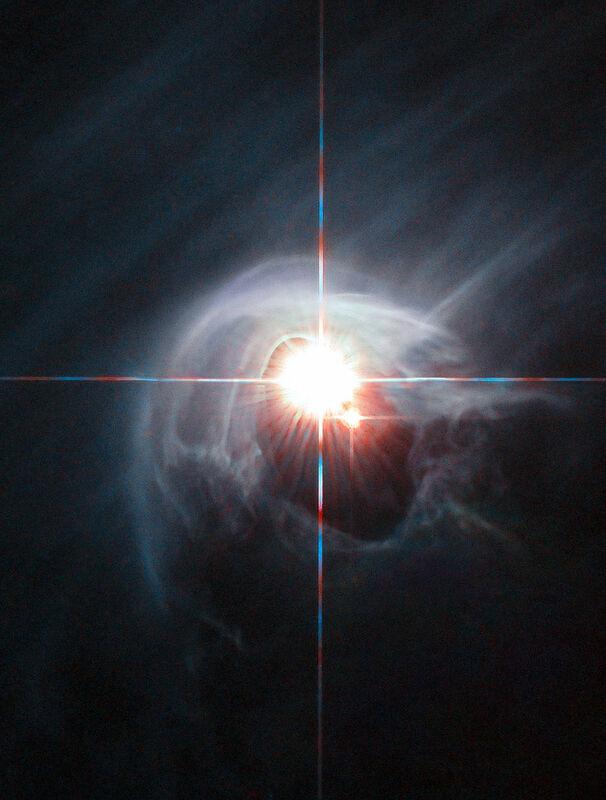 The star system DI Cha was imaged by Hubble in October 2015. The unique bright spot in its center consists of two stars shining through rings of dust, which actually hide two other stars in this quadruple star system. Besides having two pairs of binary stars, the system is notable because it has a large region known as the Chamaeleon Complex, an area that gives birth to brand new stars. Front and center in this March 2016 Hubble image is a star named IRAS 12196-6300, which lies 2,300 light-years from Earth. Researchers call this type of image a fingerprint because the light spreads out enough for them to understand what chemicals make up the star. There is just so much going on in this image that it's hard to pin down just one thing to discuss. 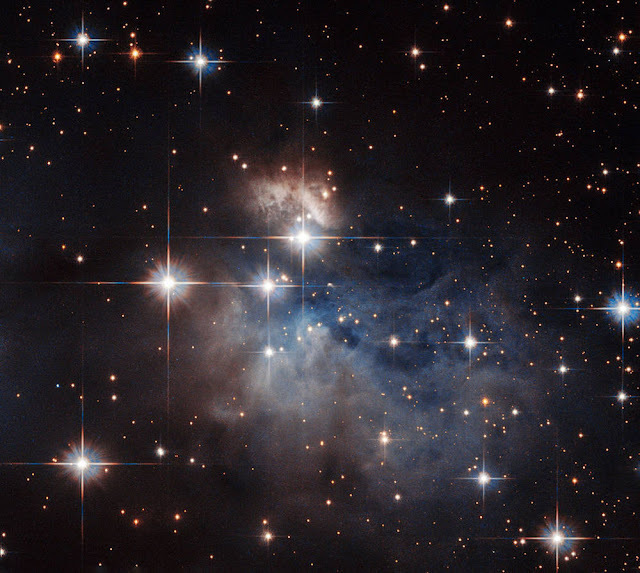 Inside, we see a ton of young stars inside a nebula. 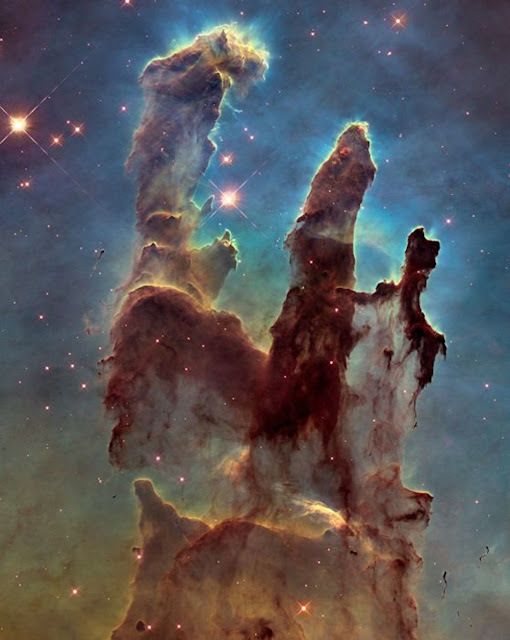 "The nebula reveals a fantasy landscape of pillars, ridges and valleys," says a NASA statement. "The pillars, composed of dense gas and thought to be incubators for new stars, are a few light-years tall and point to the central star cluster. Other dense regions surround the pillars, including reddish-brown filaments of gas and dust." 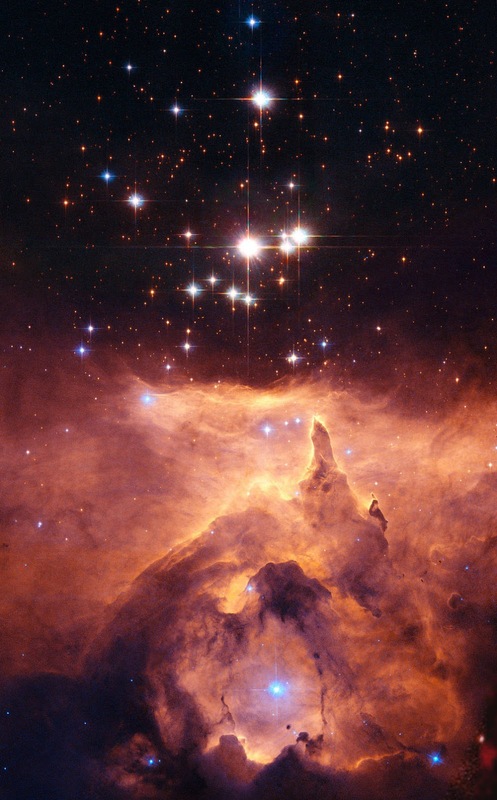 While this may look the cover a direct-to-VHS fantasy film from the late-80s, this Hubble image showcases the open cluster known as Pismis 24, the three stars directly above the nebula. In fact, the biggest star of the three, Pismis 24-1, is one of the largest stars ever recorded at 100 solar masses. 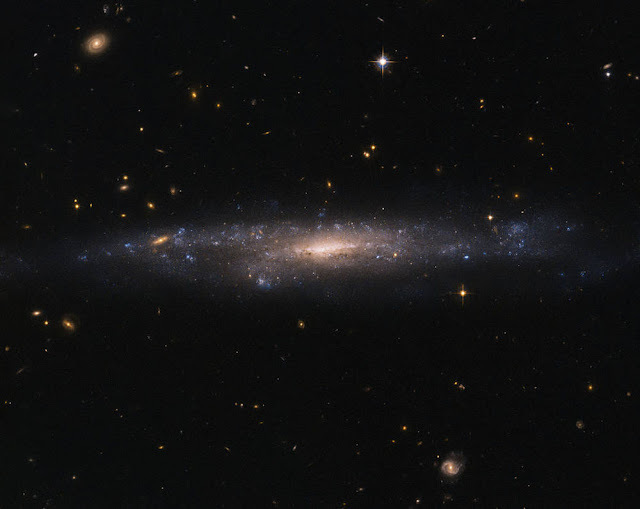 Reminiscent of the default Mac background, this image shows off the galaxy UGC 447, which lies 110 million light-years away in the constellation of Pisces. Researchers believe galaxies like UGC 447 are composed mainly of dark matter, making them prime targets for future study because, though researchers see evidence of it everywhere, dark matter is super elusive. 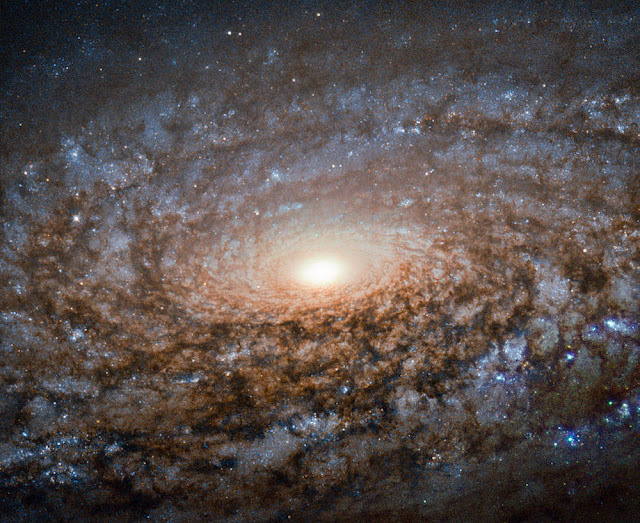 This is one of the relatively recent images captured by Hubble in April 2016. 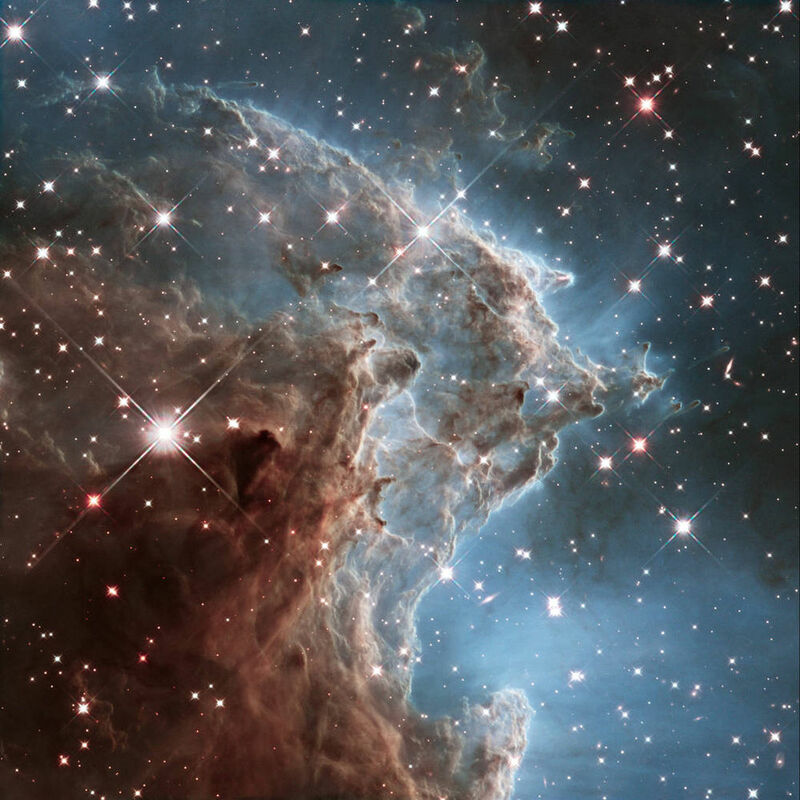 To celebrate Hubble's 24th anniversary (they always put out great images for anniversaries), researchers released this image of the Monkey Head Nebula, which is basically a star factory. This region specifically lies about 6,400 light-years from Earth.